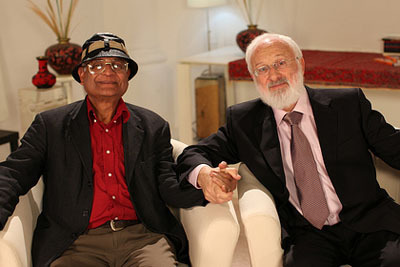 Theoretical physicist Dr. Amit Goswami talks with Kabbalist Dr. Michael Laitman through meeting points between quantum science and spirituality in a discussion about human consciousness and perception, focusing on the point where people cannot perceive in their inborn senses. Host: Hello. We're here today with Dr. Amit Goswami and Dr. Michael Laitman. Dr. Goswami is Professor Emeritus in Theoretical Physics in the University of Oregon, and he is the author of Quantum Mechanics, a textbook used in universities worldwide. He's also a pioneer in a new paradigm of science called "Science in Consciousness." And in his two latest books, God Is Not Dead and Creative Evolution, he shows us first where the hints that come from quantum physics show that there is an existence of God. And we know him, of course, from the feature documentary What the Bleep Do We Know!? And Dr. Laitman is a scientist in the field of biocybernetics; he is a Professor of Ontology, Philosophy, and Kabbalah. Dr. Goswami, in God Is Not Dead, you tell us that there is a way that we can really see that this force exists and that a lot of the mysteries, the contradictions that we understand about our life, can be solved by looking at that. And we seem to be in a different phase here. How has science looked at our reality, and what is it seeing now? Amit Goswami: Well, traditionally, at least in the past sixty years, science increasingly has looked upon all reality as based on the primacy of matter; matter is everything, and so material interactions cause everything. Material interactions start with the elementary particle sub-matter: elementary particles make atoms, atoms make molecules, molecules make cells, cells make the brain. And the wisdom is that the brain is the producer of consciousness and all the higher inner world that you spoke about in the intro. It's all due to this upward causation from the level of the elementary particles going upwards to the brain, to all these appearances. Host: Through our history, going back to Newton, this is the way that we've looked at things? Amit Goswami: Well, Newton looked upon this way, but Newton never insisted that our consciousness is brain phenomenon. The difference is that after the success of molecular biology, which happened in the 1950s, the scientists really changed their tune. Before, it was thought of as dualism - a truce between science and religion, if you will, or philosophers, if you will, where science holds onto the material domain of reality and tacitly admits that there could be other worlds, like mind consciousness. And they, of course, suffered from the criticism of dualism. The problem remained, "How does this world interact with the material world? ", but it was tolerated because it was not clear that matter can explain life, matter can explain consciousness. With the success of molecular biology and the structure of DNA double helix, scientists thought that they can now solve everything with the material upward causation, and that is the reason for the change in tune. But this is what has happened in our society; all of a sudden, we not only have become Godless, but also meaningless and valueless. Host: So this was the view as science evolved to a certain point. But when you bring quantum physics into this, what do you begin to see? Amit Goswami: I'll give you an example. Quantum physics says that every object is possibility, is a wave of possibility. And then the question is how does this wave of possibility become an actual event in our experience just by virtue of looking? May I ask you, Dr. Laitman, in the science of Kabbalah, are there actual separate objects? Is our reality a material reality or does it interact with the way in what we want, the way in which we perceive? Michael Laitman: We must not forget that we are talking about an observer, an individual, a person who is studying reality; and with respect to that person, that reality exists. We cannot say that reality exists outside of us. It is all in our awareness, in our brains, in our emotions only - only. Outside of us, if we go outside of ourselves then we are not going into something real. We are going into forms that are not connected to matter but abstract form, and that's a baseless philosophy. We will never perceive it; we will never know it; perhaps, in some other forms of existence, but not in our current present existence. That's all we have to say, that we are studying matter and the forms this matter takes on, so it all depends on our qualities. Our qualities, as much as we may divide and split them and wish to grade them, are either reception or giving, minus or plus, or however you want to describe it, however you want to define it. But nevertheless, we need to first and foremost study our qualities, and in them reality occurs. Even if we connect instruments to it, even if we studied using all kinds of theories that we have been developing for millennia; it doesn't matter. It is the same human being studying, researching, feeling; and within us, in our awareness, it happens. When we perceive reality today, we perceive it by absorption. We constantly want to receive, to swallow, to devour, to acquire it. And in this way, we see only a small part of reality. In fact, we don't see reality; we only see some kind of an internal application of it. But if we could acquire the quality of the higher nature, the Godly quality, then we would extend ourselves, be rid of the current perception of reality, and we would perceive reality as it is outside of us. Amit Goswami: Out of that evolves the instantaneous reality that we see, we experience only in mystical creative experiences or experiences of such archetypes as love, beauty, justice, truth, goodness. This is what Dr. Laitman was saying, I think. When we involve ourselves with the values and virtues, then our chance of experiencing this reality is much greater than when we are talking about mundane stuff of the ego. Host: Do you agree that qualities such as these sort of ethical qualities, or these ideal qualities like love and so on, and as you mentioned, giving or receiving... why do these things put us in touch or separate us from this quantum force? Michael Laitman: Here we can transcend our own substance, which has the nature of absorbing, of wanting to receive; we can rise above it. It is a very complicated technique, but the wisdom of Kabbalah allows us to do that. And when a person rises above it, meaning, when you change the substance that you feel in you, you change your attitude to reality. It's not like we're beginning to treat other people kindly or that's what it's about. Here we're talking about a different perception of reality that happens to a person, and then you see an opposite world, a different world. You see forces - actual forces - which physicists cannot refer to, but you see the forces that act behind matter. Amit Goswami: Actually now, the physicists can refer to this quality. You are exactly right, Dr. Laitman. What physicists tell us now, quantum physics is telling us, is that this is the difference between the conventional experience of the ego and the creative experience, the primary experience. A shift of context of looking, how we view, what meaning we put into what we saw is what happens in a creative experience. And this is the shift from the ego level of construction of reality vis-à-vis the quantum level of construction of reality. I call this self "quantum self"; the Kabbalah would have some other name, but it is the perception of what happened; that is what changes. What happens may be the same thing, but in the perception of a person who is based in the ego level would never give the meaning to it. Michael Laitman: From what I hear now, if physicists are already arriving at a state where they understand that we must change the qualities of the researcher in order to discover new phenomena, are they? Amit Goswami: Yes, it follows from this that the researcher of consciousness should transform his or her own qualities in order to research the subject. This part of it is the reason that many people are still adhering to the old paradigm because the new paradigm makes too much demand on the researcher. It says that the researcher not only must be an observer of things without the responsibility of changing himself or herself. But here really, literally, unless the researcher starts the journey of transformation, some of this will escape the mind of the researcher because his own concept is rooted in the old context of seeing. This is the reason that the paradigm shift is taking time, Dr. Laitman, unfortunately. Michael Laitman: And are there such physicists, who are already prepared to change themselves in order to arrive at this new consciousness and perception? Amit Goswami: Absolutely, there are physicists, and I call those of us who are committed to transformation while doing our research "quantum activists." Michael Laitman: From within quantum physics, as they study and research quantum physics and they feel this need for change, do you understand what kind of change it should be? Amit Goswami: Well, the change is, first of all, a change from too much preoccupation with the outside material world that appears to be outside, not really outside, as you told us before - it's all inside. But there is a preoccupation with that external material world that has to shift toward the internal world of experience, shift to meanings that we give to everything including the material. But material should become less and less important, and the inner, the values, should become more and more important. In other words, love as an experience has to precede the experience of a material object. Michael Laitman: Perhaps, we are arriving at a state where psychology can help us in this shift of the researcher, and then we will arrive at an upper quantum physics. Amit Goswami: Hopefully, we will be able to work together. The quantum physicists and the Kabbalists, and all the other spiritual people, together, help each other out, in the sense that; whereas we quantum physicists help give a more scientific language to what you guys are saying, the Kabbalists and the spiritual aficionados, philosophers; whereas you teach us how to transform ourselves. Because transformation is not only understanding how to transform, it's not only theory; it has to be done in daily life; it has to be done in our practices of daily life, and that is not so easy. Only those who have done it already can guide us. So in that sense, it will be a new era of mutual cooperation between science and spirituality. Host: What kind of qualities, what kind of transformation does the researcher have to undergo? What qualities do we need to develop in the scientist? Michael Laitman: We see that we are all only absorbing, grabbing, in a state of self-love, egoistic love. But nature has two forces to it, and even if we perform an act of giving toward someone, it's still in order to receive some kind of profit. It's like a waiter in a restaurant. He's bringing you food, but he wants a tip and his salary. So we are the same. Our nature doesn't allow us to give; it allows us only to receive, and if we give then we want to profit out of it, somehow. Within nature itself, we, nevertheless, see that there are two forces acting; the opposite force has to be there, too. So how do we come to that opposite force so it is also in our domain, so to speak? If we have the power of giving regardless of ourselves, completely without any consideration of ourselves, so I will seemingly be working with your desire and satisfying it regardless of me. It's not like a mother toward her child where she feels it, but there's instinctive love. Where there is no love between us, but I nevertheless give to you according to what you want... If I could do that, if I had that kind of perception where I perceive your deficiencies, your desires, the phenomena outside of my ego, beyond what I can imagine within me; I have a perception of reality that extends beyond me; and this is what we want to arrive at. What is the actual reality outside of us? Not the one that is depicted in ourselves and in our awareness. Host: So inside of considerations for the self or what can happen through this process, whether it's a process of science or whether it's any kind of a process, we're basically limiting all of the best possibilities that could occur? Michael Laitman: That's how we are built. Amit Goswami: Actually, quantum physics enables us to distinguish what you are talking about very beautifully. There is a crucial signature of this downward causation called "non-locality." In other words, we've all become one. Signal-less communication can take place between you and me when we have true love between us. True love is a signal-less communication; it does not require any signals. I don't have to say, "I love you" in order for you to know that I love you. So, we can classify these two forces that you are talking about; we do in quantum physics. We say that some actions, some choices, will take us toward non-locality, toward this non-local consciousness. Those are the choices that we say, "good," and some choices will produce separateness. They will put us more and more in our ego; take us farther and farther away from this non-local consciousness. That's what we can classify actually as "bad" or "evil." It's not a duality; it's just how we are reacting, how we are choosing. If we are choosing competitiveness, jealousy, the known, then we are moving away from love. Whereas, if we are choosing to give service without expecting that tip that you mentioned for the waiter in the restaurant, then we are moving toward love. So moving towards non-locality, moving away from non-locality, a very beautiful distinction that quantum physics gives us. Michael Laitman: Can physicists explain... do they understand that the more we advance toward a state that is timeless and space-less, these trends make us one and in a state of love? Do they understand? Can we tie these two languages together: the language of emotion and the language of physics' terminology of no place, no space, no distance? Amit Goswami: Very beautifully put, Dr. Laitman. Indeed, this is the signal-less communication that takes place outside of space and time, which is another way of saying that there is no space and no time in that reality. So, moving beyond space and time is what our objective is. Michael Laitman: So that kind of forces us to reach some bonding between us? Amit Goswami: That's right. This is the bond. This is the bond. What the Kabbalah says, "no space, no time," we say, "non-locality." We have an experimentally determinable terminology because we can just look at such a communication and see if any signal was necessary. If we find no signal, then we know that we've reached a non-local consciousness. If, on the other hand, signal exists, then we know that there was only talk of love, but there is no real love. Michael Laitman: Kabbalah regards evolution as going from generation to generation, and also within one's life, it is derived by the evolution of our egos; our desires grow. In other words, desires grow within people and it prompts them to develop technology and economy and human society, etc. It's interesting that we have arrived in our generation to the limits where we are not studying reality anymore, but it's as if we're trying to penetrate the boundaries of reality. What do you think? What does that symbolize? Amit Goswami: What materialists say fundamentally is that we do not have free will to choose; we are just products of Newtonian determinism and in addition Darwinian determinism. Evolution has given us brain circuits, and we are helpless before them. What the spiritual tradition says, that while we have this negative emotional brain circuit of competitiveness, greed, jealousy, anger, and what have you; we also, by listening to this power of downward causation and acting on them; we can create our reality in which we make positive emotions for ourselves and in our relationships; and we can create positive emotional brain circuits that will then mollify the negative emotional brain circuit; and so we can overcome our base desires. Michael Laitman: But before that, there is no choice. Before we arrive at this positive reality, there is seemingly no choice, and we advance only through the force of the ego, the evil force with consideration of gain as much as possible for the minimum effort. And this is the formula by which we exist. Meaning, until we use some kind of transformation of ourselves, until we rise to a state of giving and love, and position ourselves between the two forces: reception and giving, the hate and the love forces, so we have both of them. And between them we will have free choice. For now, it doesn't exist in us, and perhaps we have arrived at a state where today it's becoming clearer and clearer that this is what humanity must receive; that's the shift. Amit Goswami: Yes, that's the shift, that's the shift. Unless we have a compensation of the negative tendencies and brain circuits that will compensate automatically, brain circuits that we have created by voluntary acts of loving, deliberately by practicing; we really are short-changing; we are compromising our ability to create this new, very loving future for ourselves. Michael Laitman: When we arrive at this new reality, when we have these two forces, and we are free to use the negative force and the positive force, and then it will only be called negative or positive because there will be no negative or positive; we will be using both in a way that we will then see what is the real good. Where is the God here, the Upper Force in this situation? We have these two forces that give us an ability to be free with this new consciousness and a new perception of reality. Is there a room for an even higher force? Or perhaps, the positive force, the force of giving and love that we will acquire, will satisfy us and turn us into free human beings. Amit Goswami: I think we've become appropriate in that case. What happens, when this balance is reached between giving and taking, between the negative and the positive, then the ego does not need to act anymore. We can surrender to a level of choice, which is really Divine choice, which is always done appropriately. That will take us to further and further reaches of evolution. Michael Laitman: In other words, the third force, which is called "God is in the middle" and the right choice itself, is between the two forces; it's in the middle? Amit Goswami: Yes, sort of. By balancing, we have surrendered the ego, and then God can come to play. And then we become more and more - of God. Michael Laitman: Within our choice. Amit Goswami: Within our choice, when God's choice and our choice become identical; so it's really that the distinction becomes moot. Michael Laitman: I see that you're a Kabbalist. Host: Does He look like a physicist to you? Michael Laitman: That's exactly what Kabbalah is talking about. Amit Goswami: But quantum physics is really very, very good in terms of establishing these relationships with ancient traditions. What the ancient traditions intuited creatively, with creative insight, quantum physics now can corroborate that with scientific data, with scientific theory, and scientific projections. So, it is mutually enriching discussions and dialogues that we are going through right now. Yeah, and this is what we have to bring to fore; that: Look, we have very ancient systems, before even when the religions arose that already are reminding us that reality is fundamentally one; it's all consciousness. There is choice, and that choice can become identical with the Divine rule of creativity, and that takes us toward evolution. This is in summary what quantum physics is saying also. It's so wonderful! Host: Talking about non-local phenomena, in preparing for this I was looking at things on your site. I discovered that both of you, at the same time, wrote a letter to President Obama offering this higher, more inclusive point of view and so on. So we are brothers in quantum I see, and we have a shared goal together. And I want to thank you very much for joining us. It's been wonderful, lovely, very enlightening. And I want to thank Dr. Laitman for a very lively discussion. We end our program here on this happy note of connection. And we'll see you again. Goodnight.